You’ve probably heard a lot about dogs that help the armed forces sniff out bombs, search for survivors after attacks, and assist the men and women who serve, but there are also brave cats out there that do all sorts of jobs for soldiers on land and at sea. 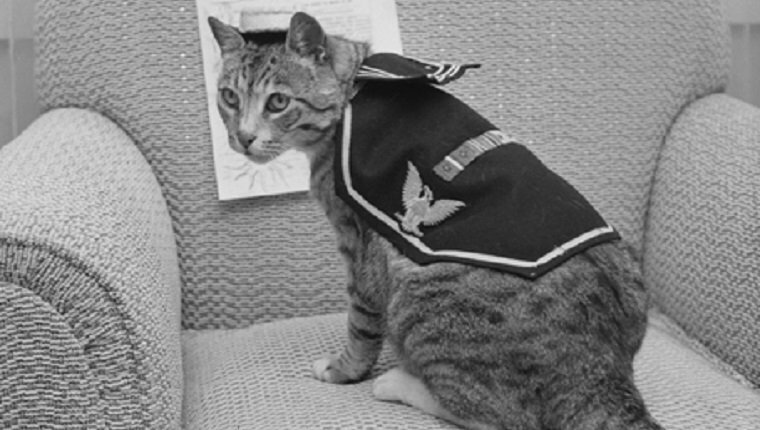 Here are eight cats of war who helped the armed forces in times of crisis. 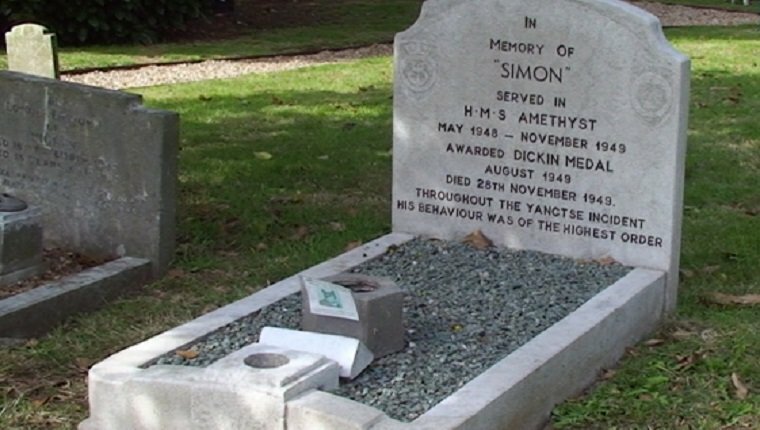 Perhaps the most decorated cat in military history, Able Seacat Simon was found on a dock in Hong Kong by a British seaman, who smuggled him aboard the HMS Amethyst. It wasn’t uncommon for ships to have cats aboard, as they were good at killing mice that might eat the food supply, chew through ropes and wood, or spread disease. Simon got straight to work as a mouser, leaving “presents” of dead rats in sailors’ beds. The crew loved the cat for his adorable antics, and he helped boost morale. Simon even made friends with Peggy, the ship’s dog. After about a year at sea, the ship came under fire near Nanking. In the battle, Simon was wounded by shrapnel and fled somewhere deep into the ship. He was missing for eight days, and the crew feared him dead. But he reappeared, dehydrated, covered in dried blood, and with his whiskers and eyebrows burned off. He was taken to the medic and stitched up, but in his absence, the rats had gone out of control. They infested the food supply and made life miserable for the crew. Even though he was injured, Simon got right to work, killing two rats in his first night back. Over the next few days, he cleared the deck and eventually killed one massive rat that had earned a reputation as being a particular nuisance. That’s when the crew named him “Able Seacat Simon,” the first military title given to a cat. He continued to bring a shell-shocked crew comfort on their voyage. Simon received three awards for his behavior, but tragically passed away due to complications from his injuries. He was buried with the respect of all of Britain with full naval honors. U.S. soldiers stationed in Iraq were joined in their tent one night in 2004 by a kitten who was born on their base. The kitten’s littermates had run off, but he stayed with the army unit, chasing off mice who would have eaten or contaminated the soldiers’ food. But even more important than his role as a mouser, the cat served his soldier buddies as a friend and source of comfort in an extremely stressful situation. The soldiers made him an honorary member of their unit, naming him Private First Class Hammer. When it came time for the unit to go back home to the United States, Staff Sgt. Rick Bousfield couldn’t let one of his comrades get left behind. He wrote a passionate letter to Alley Cat Allies, a rescue group that was moved by Pfc. Hammer’s story. 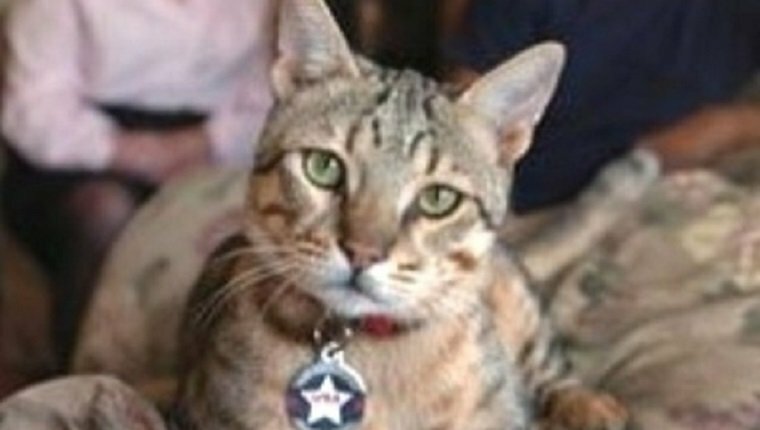 They raised money to transport the cat to the U.S. where members of his unit were waiting to give him a hero’s welcome. Pfc. Hammer lived out the rest of his days with Bousfield and his family until he passed away in 2015. Meet ‘Crimean Tom’ from @NAM_London. Read his story here. http://t.co/A5WiYJGi72. #MuseumCats. pic.twitter.com/10UWDO1yyj. Some choose to be heroes, while others become heroes completely by accident. In 1854, British and French soldiers endured the hardships of Russian winter as they began a siege of the port of Sevastopol on the Crimean peninsula. It was a full year before troops could search the remains of the port, and by then they were suffering. Captain William Gair found a large tabby cat in a cellar while investigating. The cat was very tame and didn’t scratch or hiss. He seemed unaffected by all the chaos of the siege, as rats were in large supply on the port, even in winter. The cat came back to the officer’s shelter, where soldiers adored him. They called him Crimean Tom. One day, Tom ran out of the military compound, and some of the men followed him. He led them to a pile of rubble, attracted by the rats that were living inside of it. That rubble hid a storeroom that was blocked off to humans, but easily accessible by the small feline. The men uncovered the room and found it full of food. The soldiers, suffering from hunger, were very relieved. Tom continued to show the men hidden storerooms that held food by following the rats. The cat was hailed as a hero and returned to London where he tragically passed away a year later. His body was stuffed and given to the Royal United Service Institution. 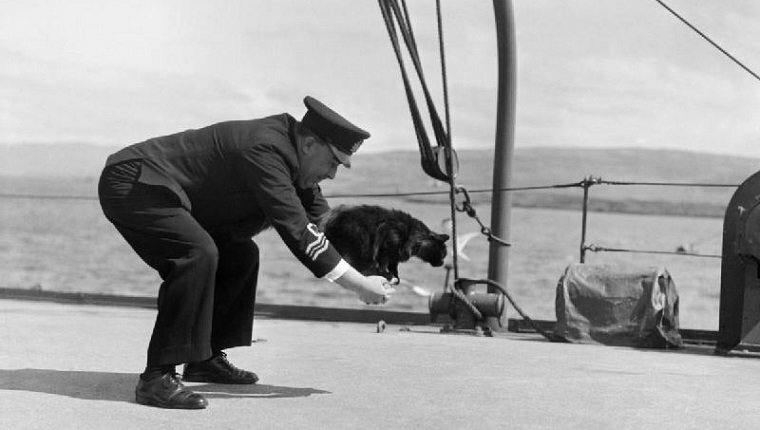 The master cat aboard the HMS Western Isles during World War II was Peebles. The ship was used as a headquarters for the Royal Navy’s battle school for U-boat hunters, and Peebles served the important job of mouser, keeping the ship safe from rodents who might chew through wiring or eat food rations. However, Peebles had another important job as entertainer for the men on the ship. By all accounts, he was a very intelligent cat and performed a variety of tricks, much to the delight of anyone who came aboard. He was known to “shake hands” with strangers who entered the wardroom and was capable of “jumping through the hoop” of his humans’ arms. 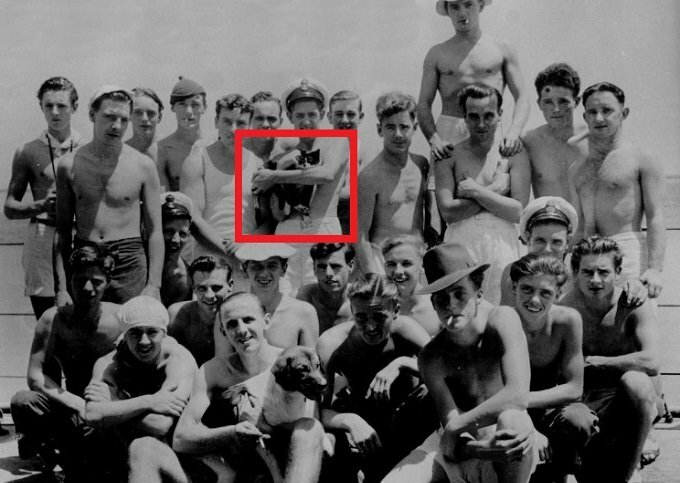 Peebles survived his time on ship during World War II. If ever there were a cat born for the high seas, it was Tiddles. 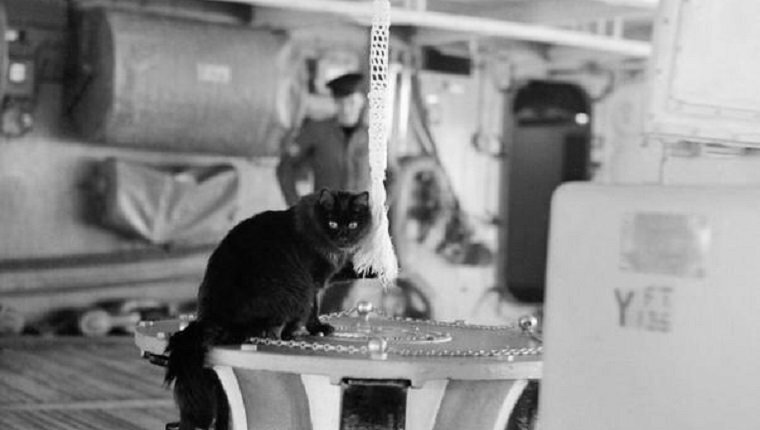 Tiddles came into this world on the HMS Argus and later served on the HMS Victorious as the official Captain’s Cat. He must have been good at his duties as mouser on the ship as he spent his whole life on board aircraft carriers of the Royal Navy and sailed for over 30,000 miles in the 1940s. Tiddles could often be found at his favorite place on the ship, the after capstan, where he could sit around and play with the bell-rope. His lasting claim to fame is that he may be one of the reasons black cats are considered lucky in Great Britain. Salty became a U.S. Coast Guard mascot at the San Diego Coast Guard Air Station in California during World War II. She inadvertently found her way into the history books by becoming the first cat to take part in a rescue mission. It happened when she stowed away on an amphibian reconnaissance plane with her kitten. The two cats were on board when the plane took off on its way to rescue a pilot whose plane had come down at sea. Mourka lived in the Russian army’s headquarters in Stalingrad in World War II. The German siege of Stalingrad was a long and terrible battle in the city, and it became too deadly for Soviet scouts to run messages from the battlefront to headquarters. The commander, however, had a plan. Since Mourka always ran from the fighting to the kitchen at headquarters, he gave the cat to a gun crew stationed at the front and instructed them to put messages in Mourka’s collar and let him go. Mourka risked life and limb to run messages from the front, and he was greeted in the kitchen with lots of treats and pets. He did his job for several months before disappearing in action. Though his fate is unknown, he saved human lives with his service and is remembered as a war hero. Pooli is short for Princess Papule, and she was born on the Fourth of July in 1944 in the Navy yard at Pearl Harbor. She was taken aboard the USS Fremont, an attack transport, where she saw plenty of action. Her ship was in battle at the Marianas, the Palau group, the Philippines, and Iwo Jima. Pooli would head for the mail room and curl up in a mail sack whenever she heard the battle stations ring, and the main danger she faced was when some of the sailors aboard her ship were heading for home. They considered throwing the cat overboard for fear that they would be quarantined in San Francisco because of her. But those who loved the cat wouldn’t have it, and they put a round-the-clock guard on the cat for three days until the ship docked without any problems. Pooli lived a long and happy life after the war and earned three service ribbons and four battle stars. Which cat that served the armed forces is your favorite? Have you heard of any other amazing cats that served the troops? Let us know in the comments below!